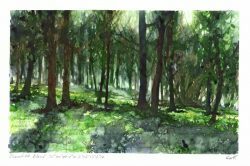 GARY Cook, a Shaftesbury-based environmental artist, shows recent paintings which record endangered Dorset woodlands in a solo show at Shaftesbury Arts Centre from 21st to 27th March. He has been working in the dappled light of the north Dorset woodlands in what he describes as a race against time to record some of the county’s most treasured views before a little-known threat to ash trees changes them forever. The exhibition of 25 plein air watercolours of classic Dorset woodscapes is called Rooted in Dorset, and is a celebration of the endangered ash tree. For 26 years, Gary Cook was an associate editor and the senior artist for The Sunday Times, winning many international awards for his illustrations. 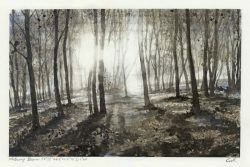 In his new environmental paintings, he subtly layers traditional watercolours with statistics about the effect ash dieback could have on our iconic woodlands. His recurring theme is that 1,058 species, from bats to beetles and lichens to mammals, are dependent on ash trees. All will be affected with the trees’ decline and even the experts cannot predict what the knock-on impact of such dramatic habitat loss may have on wildlife generally. Gary has exhibited widely in the South West and London and has work selected for upcoming exhibitions at the Royal Institute of Painters in Water Colour (RI) at The Mall Galleries in London and at the Society of Graphic Fine Art show at the RK Burt Gallery also in London. Pictured: Melbury Beacon, Winter; and Duncliffe Wood 2. Posted in Private View on 16 March, 2018 .